Feb 16, 2013 Posted by AAfterwit on Feb 16, 2013 | Comments Off on Where Is The Accountability? See a need – fill a need. That is what the parents and staff at the Stratford Landing Elementary School in Alexandria, Virginia thought when they looked at the playground upon which their kids were having recess. The school’s PTA, along with the staff of the school, decided to upgrade the playground equipment for the 870 kids that attend the school. A massive fund raising effort of bake sales, raffles, and door to door sales resulted in $35,000 which would purchase a monstrous, climbing apparatus which seems to be the dream of every kid that has ever stepped on a playground. All along the way, the PTA and staff consulted with the Facilities Department of the Fairfax School Board. The parents got approved vendors for equipment, submitted proposals, contractors, prices and most importantly, the money to pay for the whole thing. With input from students, the PTA bought a climbing obstacle developed by Landscape Structures, a Minnesota-based playground equipment manufacturer. The group chose the popular Evos system, with arching spans of tubes that more closely resemble a modernist sculpture than the wooden platform playground equipment of yore. The PTA then hired Isaac Sparks, a construction manager for Sparks @ Play, a playgrounds specialist based in Owings Mills, Md., to install the structure. By early November, the students were romping all over it. If things had ended there, we wouldn’t be writing about this other than to note how parents and citizens made a difference. We look at the structure and think it is awesome. However, things didn’t end there. Soon, however, a county playground inspector was on the scene, declaring the structure a hazard. In a written report, the inspector found that among other safety issues, parts of the structure were too tall. One part of the equipment is 94 inches above the ground, 10 inches higher than the school system allows. The report said that deviating from the school system’s playground protocols “places users at an increased life-safety risk” and that the Evos system could lead to head injuries and neck entrapment. “The equipment should be removed from the property,” according to the report. 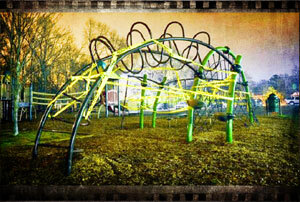 The County then proceeded to wrap the equipment in yellow “police caution” tape which barred the kids from using it. To try and “make things right,” the County made the very strange offer of removing the Evos equipment the PTA had paid for and had installed, and giving the school $135,000 for the playground. We disagree with that. In a perfect world, the people who made the mistake of telling the PTA the equipment was approved and approve the installation should be the ones to pay back the PTA. If that means garnishing their wages, we are all for it. In many cases in the private sector, when an employee makes a mistake, they are held financially accountable for that mistake. In this case, the Facilities Department took the hard work of the PTA and school staff, flushed it and the $35,000 down the drain. Someone should be held accountable for this and the parents should not lose their $35,000. As we were writing this, we were alerted that the County has come up with a compromise that will allow the equipment to remain on the school playground. His plan calls for the new equipment to remain in place, except for one part, a rotating spin-top mechanism called the Gyro Twister. Platenberg wrote that small modifications will be made to the equipment to improve overall safety and that the facilities department will renovate the playground to bring it into compliance with the Americans With Disabilities Act. Once the updates are completed, the playground will reopen to Stratford Landing’s 870 students, Platenberg wrote. People will walk away from this thinking “all’s well that ends well” because the kids will have a great piece of equipment to climb on and just be kids. We agree with that but can’t help thinking this never should have happened in the first place and the resolution of the dispute doesn’t take away from the fact the County never took ownership of the mistakes it made. Someone still needs to own up and be accountable for this fiasco.